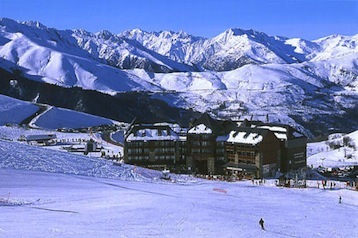 Peyragudes ski resort is split into two areas – Agudes and Peyresourde. Together they have 60 km of pistes (5 green, 20 blue, 20 red and 4 black slopes) that cover an area of 1500 hectares at an altitude of between 1600 m and 2400 m.
There are now 3 circuits for snowshoeing, ideal for discovering the scenery, wildlife and the magnificent mountains. 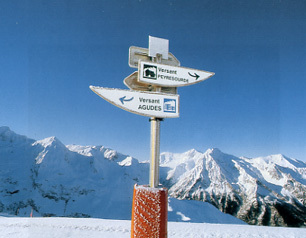 The resort also has the Vallee Blanche, an off-piste route consisting of 6km of groomed pistes. 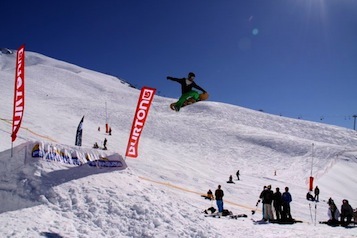 At 2000 m the snowpark has everything you need to enjoy a great holiday with 6 tables (4 – 12m long), a hip and slide bar and is sponsored by Horsefeathers (King of Snow). Other activities at Peyragudes include husky rides, paragliding, speed riding (combining paragliding and skiing), airboard (inflatable sled) and if you wish you can spend a night in an igloo with a mountain guide.